In U.S. Patent Application 20100080994, Hong Kong University of Science and Technology (Hong Kong, CN) scientists describe improved methods of producing carbon nanostructures at lower temperatures. The methods disclosed result in the production of carbon nanostructures having uniform wall thickness. Significantly, the methods do not employ metal catalysts, and the temperatures required as not as high as those currently used. Preferred polymers for use are glycol based polymers, particularly ethylene glycol based polymers. Preferred polyethylene glycol base polymers are polyethylene glycol block copolymers, with PEG-block-PPG-block-PEG polymers particularly preferred as the source of carbon for the process. Other polymers such as polyethylene or polyethylene oxide are also useful in the forming carbon nanotubes. While anodic aluminium oxide or photonic crystal templates are useful any material with the appropriate physical properties could be used. A suitable template will contain appropriately shaped nanochannels, and should be easily removable from the carbon nanostructures that are eventually formed. Anodic aluminium oxide templates are particularly preferred, as they may be removed from the formed carbon nanostructures with relative ease. FIG. 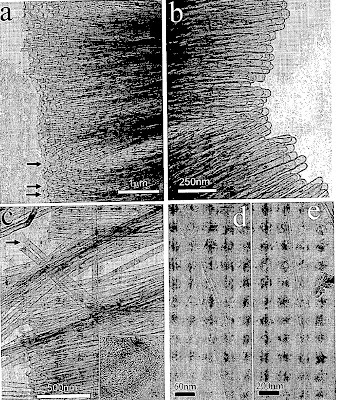 2 shows SEM images of carbon nanotubes (CNTs) made according to the invention. FIG. 2(a) is an aerial-view taken from CNT arrays formed in the channels of an AAO template, while FIG. 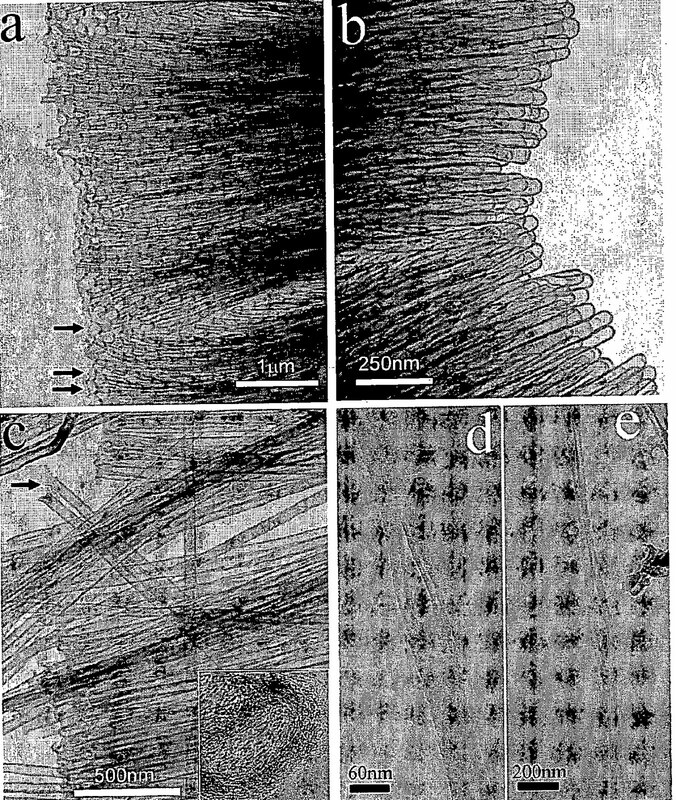 2(b) shows CNT bundles extracted from an anodic aluminium oxide template by chemical etching. A quartz reaction chamber and an anodic aluminium oxide (AAO) template were used to synthesise carbon nanotubes. A PEG-based polymer was used as the carbon source. Evaporation of polyethylene glycol began at 160 degrees Celsius, and the evaporated molecules settled in the nanochannels of the AAO template, forming the initial polymer layer. The thickness of this polymer layer was not uniform at this stage, as more material was deposited near the open ends of the nanochannels than in the nanochannels themselves. The evaporation continued, with the smallest polymer molecules being the first to evaporate, and the largest molecule 3,6,9,12-tetraoxahexadecan-1-ol evaporated at around 315 degrees Celsius. The polymer was completely evaporated by the time the temperature of the reaction furnace reached 320 degrees Celsius. As the reaction chamber temperature was raised from 320 to 500 degrees Celsius, annealing took place. A uniform thickness polymer layer was formed at this stage. 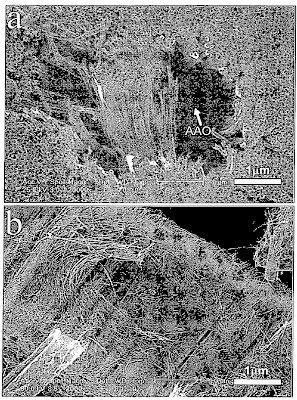 High-temperature carbonization for 30 minutes (at temperatures in excess of 500 degrees Celsius) of the polymer layers resulted in the formation of carbon nanotubes with uniform wall thickness along their entire length. A CrO3/H3PO4 solution was used to dissolve the anodic aluminium oxide template. The resulting carbon nanotubes were photographed, and can be seen in FIG. 3(a) to FIG. 3(e).